Sift together the flours, baking powder, salt, cinnamon and ginger. Add the remaining ingredients to a blender and blend well. Next, pour the wet into the dry and mix gently until just combined. (Note that my blender doesn’t quite have the capacity for all the liquid ingredients so I hold back the 1 cup of water and add it at the end – or rinse out the blender with it and then add it.) Now make this mixture into waffles according to your waffle maker’s directions. I get about a dozen waffles from this recipe. They freeze well and re-heat easily in a toaster. Don’t have a waffle maker? No problem. Just add about a half cup more water or soy milk and make pancakes! Also note that if you don’t have spelt flour, equal parts white and whole wheat will work fine. I’ve made these with up to 2 cups whole wheat flour and they turn out fine. You can try white whole wheat also. Finally, here’s one more tip: measure the canola oil first then use the same quarter cup for measuring the molasses, this way it’ll slide right out of the cup. Six tablespoons is one quarter cup plus another half a quarter cup – just eyeball it and it’ll be fine. Sound good? 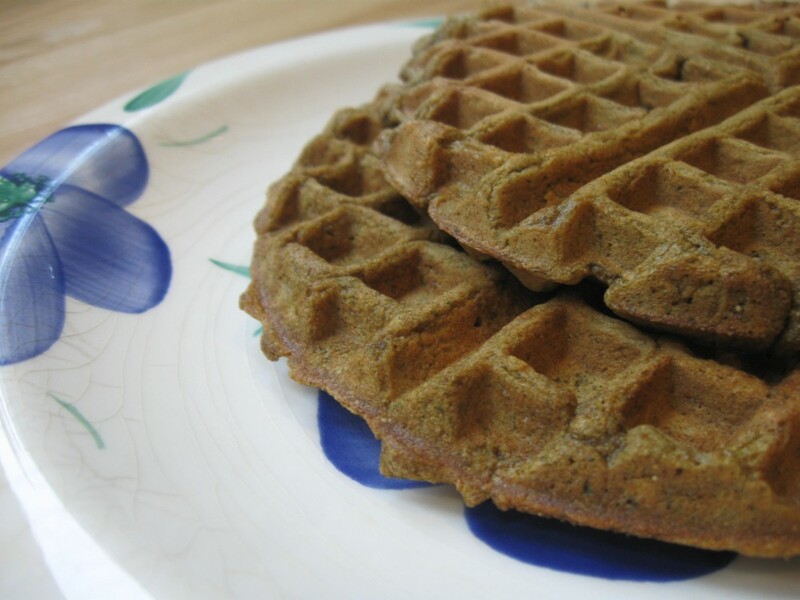 Here’s another waffle recipe in the same mold from Darlene’s blog.